We are extremely pleased to introduce our new Tecopia Essenetia Clay Mélange. We blend of the finest edible clays in North America to achieve the highest quality clay supplements available. Not only are we offering synergetic blends of the finest therapeutic grade clays, but we offering our clay blends at bulk discount prices, making clay supplementation affordable for the entire family. 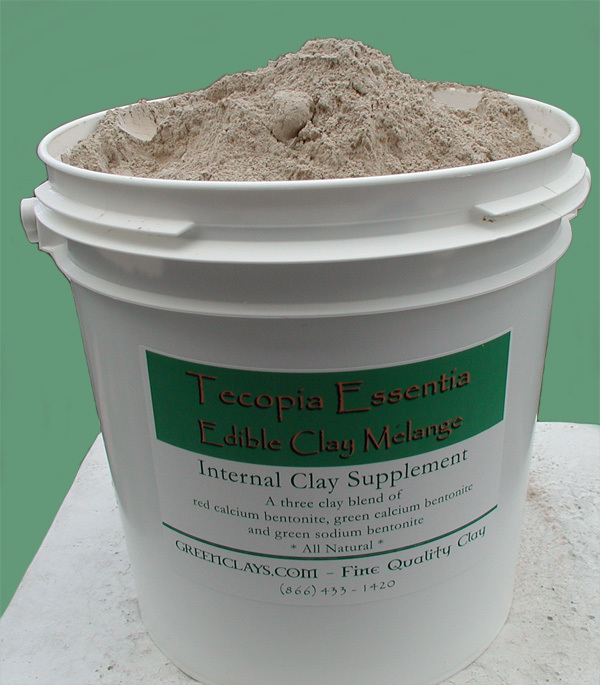 Our bulk edible clay is currently available in one gallon containers (six pounds of clay) or 3.5 gallon containers (22 pounds). Our clay is shipped as a finely milled powder, and is ready for use simply by mixing it with water. Many people have been confused when trying to determine what kind of clay is best for human and animal consumption. Are experts like Dr. Anderson, V.E. Irons, and Dr. Schulze right about using a sodium bentonite for digestive health? Are those who insist on using green calcium bentonite correct? What about those who say that the sedimentary red desert clay is most excellent? We've been studying healing clays for over 17 years; all types of healing clays from all over the world. The truth is that they are all correct. Each of the finest clays in the world have their advantages. Each have properties that are shared with each other, and properties that are unique to each clay. Green Desert Calcium Bentonite/Montmorillonite - Our desert clay is one of the most celebrated clays in natural medicine. It is an extremely clean volcanic-origin clay rich in active, ionic trace minerals. It is extremely alkaline, with university tested and time-proven antimicrobial properties. Red Desert Calcium Bentonite Clay - One of the most studied clays in modern times, our extremely clean and active "red" calcium bentonite is a clay that has been scientifically proven to deliver important trace minerals deep into the body, where they are actually bioavailable. It has long been used as an internal detoxifying agent and as an effective trace mineral supplement-- by both humans and animals. Deep Green Sodium Bentonite - The classic American intestinal cleanser, used by experts such as V.E. Irons, Dr. Schulze, and Dr. Anderson. Our green bentonite is extremely clean and air-purified. Sodium bentonite was studied by doctors in the 1950's and 1960's for its potential use with a wide variety of stomach and intestinal ailments. 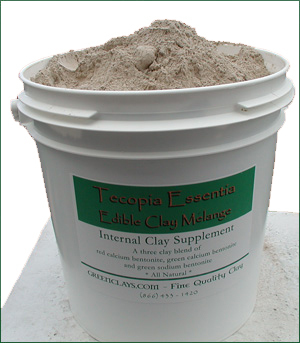 Our three clay internal use blend now comes with a new option: Fresh water diatomaceous earth! Our first offer is a union of three of the finest therapeutic smectite clays, blended together and ready for use and/or for repackaging and relabeling: Our three clay blend is for serious colon cleansing and supplementation. This blend is for those who are used to colon cleansing or need deep cleansing of the digestive tract. Fans of Dr. Anderson, V.E. Irons, Dr. Schulze will be greatly pleased with thrilled with our blend. This clay blend is ideal for those who have worked hard to keep the body in a state of optimum health; it is also ideal for those who are in need of serious digestive system repair. Order this product and receive a comprehensive usage guide. For greater quantity discounts, including pallet-size orders, please email us for a custom quote and custom invoice. Our next offering is for individuals who have very weak digestive systems, or feel that they do not need a deep colon cleansing program. This clay supplement can be used for macro, micro and trace mineral supplementation. It can be used for general detox programs. It does not include the air purified sodium bentonite. This two clay blend is also suitable for external use, including clay poultices, compresses and cosmetic applications. If you are not certain which clay is right for you, email us directly with your particular needs! For greater protection, all of our edible clays are dry ozonated during the blending process. The one gallon container is currently the only size we stock. 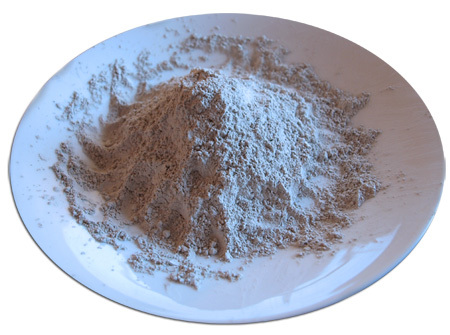 We Specialize in wholesale and bulk sales of the finest quality therapeutic, homeostatic therapeutic calcium bentonite / montmorillonite in the United States. None of the statements on this website have been reviewed by the FDA. No products presented are designed to diagnose, treat, or cure any illness.